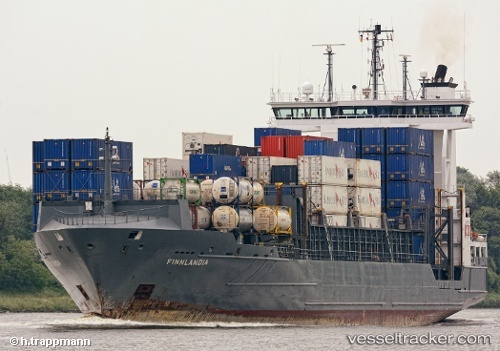 The Dutch cargo m/v "Carolina" (IMO: 9382748), was in collision with the"Finnlandia" on Feb 11, 2012, at 02.30 a.m. in the Great Southern Lock of the Kiel Canal in Brunsbuettel. The "Carolina" ran into the stern of the "Finnlandia" enroute Emden-Norrkoeping. When it left the lock it ran into the stern of the "Finnlandia" which was enroute Hamburg-Stockholm. Both ships suffered slight damage, no injuries, no spill reported. Both ships continued their voyage after inspections by the police in Kiel-Holtenau after arriving there. The "Carolina" berthed in Norrkoeping on Feb 13 at 3.3 a.m., the "Finnlandia" reached Stockholm on Feb 12 at 6.40 p.m. In the morning of Jan 4, 2012, the "Finnlandia" lost its anchor including chain on the anchorage of Antwerp. The ship moored at the Waalse Quay at 5.15 p.m. for surveys.